Life isn’t the sweetest candy. Sometimes, when I feel like the world is just too heavy, I look around and find people who continued to live fascinating and wonderful lives. Then I pause and observed for a while… I figured out that maybe, they start to work on a place called ‘self’. To love oneself means to accept that you are not a perfect being, but behind the imperfections must lie a great ounce of courage to be able to discover ways on how to improve your repertoire to recover from our mistakes. Genuine happiness isn’t about driving the hottest Formula 1 car, nor getting the employee of the year award, earning the highest 13th month pay, or beating the sales quota. Sometimes, the most sought after prizes in life doesn’t always go to the fastest, the strongest, the bravest or not even the best. So, how do you become genuinely happy? Every one has his own definition of ‘happiness’. Happiness for a writer may mean launching as much best selling books as possible. Happiness for a basketball rookie may mean getting the rookie of the year award. Happiness for a beggar may mean a lot of money. Happiness for a bu siness man may mean success. So, really now, how do we become genuinely happy? Simple. You don’t have to have the best things in this world. It's about doing and making the best out of every single thing. When you find yourself smiling at your own mistake and telling your self “Oh, I’ll do better next time”, you carry with you a flame of strong will power to persevere that may spread out like a brush fire. You possess a willingness to stand up again and try – that will make you a genuinely happy person. When you learn to accept yourself and your own faults. You pass step 1 in the project “how to become genuinely happy”. For as long as you know how to accept others, you will also be accepted. For as long as you love and know how to love, you will receive love ten folds back. Again, throw me that same question “how to become genuinely happy?”. I’ll refer you to a friend of mine who strongly quoted- “Most of us know that laughter is the best medicine to life’s aches and pain. But most of us don’t know that the best kind of laughter is laughter over self. 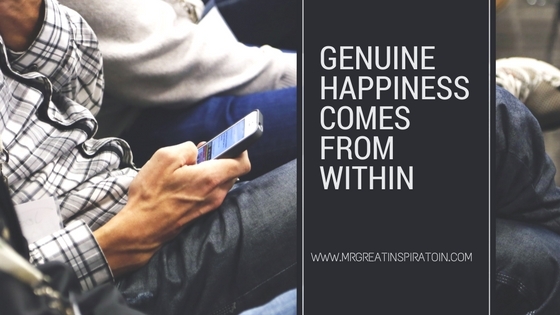 We hope guys you find Quote "Genuine Happiness Comes From Within" by Mr Great Motivations useful. If you think we have made some efforts, then don't forgot to appreciate us by sharing this Quote with your friends and family, And thanks for visiting.